1This paper is basically concerned with an analysis of two different, but related and comparable, processes in the development experience of Latin America. Both, as described here, look at the impact of the state at the periphery (with both concepts of state and periphery being widely defined) and try to consider the relation between, in particular, the role and contribution of the state, on the one hand, and the role of what, commonly, would be defined as civil society — or elements of civil society — on the other. 2The analysis is founded on a consideration of two particular pieces of field research from Mexico and Brasil : both studies consider the impact of centrally directed policies in marginal areas and look at the implementation of these policies at the grass roots level. The first set of considerations on Mexico is based on the work of the Comisión del Papaloapan, a regional development agency, founded in 1947 and working in the Papaloapan River Basin, an area to the south-east of Mexico City. 3The research here has tried to understand which factors are most important in the provision of infrastructure, particularly in new settlements (i.e. of less than 30 years of age). This infrastructure is understood as providing the necessary, if not sufficient, conditions for successful development and continuation of rural communities in Mexico. 4The broad conclusion of this research is that both the role of the state and the role of the recipients (i.e. the people involved in the process of regional development) are equally important. 5From the Papaloapan experience at least, the research shows that state agencies working at the grass roots level will have considerable difficulty in implementing successfully any form of integrated development policy if the beneficiaries are hostile to their programmes. 6The examples selected from field research show that both directed and spontaneous settlers may be unresponsive to the advances of state agencies. On the other hand, it is increasingly clear that communities with a good, clear working relationship with a state agency, such as the Comisión del Papaloapan, have made rapid and significant advances in the process of regional development. The secret of success, therefore, seems to lie in the state agency seeking, right from the start, to involve in the elaboration and execution of development policy, the fullest possible commitment and involvement of the people whom this development policy is meant to benefit. 7The second case is rather different, and opens up a number of new avenues for discussion. This study, a one year project, considers some aspects of the provision of social welfare in Brazil, through a detailed examination of the Legião Brasileira de Assistência (LBA), (financed by the British Social Science Research Council). 8This organization was founded by Dona Darcy Vargas, wife of President Getulio Vargas, in 1942, and functioned, until relatively recently, as a charity. Within the last few years, LBA has been absorbed into the Ministério da Previdência e Assistência Social (the Ministry of Social Security and Welfare) and has begun to play a very key role in the provision of social welfare at various levels. 9The LBA does not claim to be tackling the political, social and economic causes of poverty in Brazil, but it does claim to be helping the most marginalized of the country’s inhabitants to begin to help themselves : they also admit that the work they are doing is, at the moment, « a drop in the ocean » of poverty. 10The organization works principally through a number of specific, but interconnected, projects, using the services of some 6,000 volunteers, in conjunction with the skilled services of about 4,500 full-time employees, such as administrators, social workers, doctors, nurses and dentists. 11Again, the basic hypothesis of this research, and one which is being borne out in the work so far (although, clearly, this is still not complete) is than an absolute sine qua non for success in this area is the active and enthusiastic contribution of the state, as seen, in this case, through LBA as part of the wider body of Prêvidencia Social. But, equally important, and some would say perhaps more important, is the contribution of the clients (in the sense of recipients or beneficiaries) whom the programme is meant to help. This is, indeed, one of the basic elements in the whole development ideology of LBA, particularly as it has been evolving in the last 3 years or so. 12The main concern, then, of this paper is to look at the Mexican experiment in regional development and at the Brazilian programme of social welfare provision, and consider, in particular, the relationship between the role of the state in this process and the role of the people most affected. ALLEN, Elizabeth A. 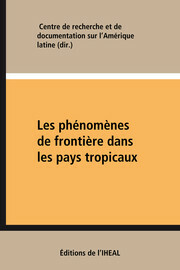 The state and regional development: some comparative experiences from Mexico and Brasil In : Les phénomènes de frontière dans les pays tropicaux : Table ronde organisée en l’honneur de Pierre Monbeig [en ligne]. Paris : Éditions de l’IHEAL, 1981 (généré le 19 avril 2019). Disponible sur Internet : <http://books.openedition.org/iheal/1429?mobile=1>. ISBN : 9782371540255. DOI : 10.4000/books.iheal.1429. Allen, Elizabeth A. “The state and regional development: some comparative experiences from Mexico and Brasil”. Centre de recherche et de documentation sur l’Amérique latine. Les phénomènes de frontière dans les pays tropicaux : Table ronde organisée en l’honneur de Pierre Monbeig. Paris : Éditions de l’IHEAL, 1981. (pp. 289-290) Web. <http://books.openedition.org/iheal/1429?mobile=1>. CENTRE DE RECHERCHE ET DE DOCUMENTATION SUR L’AMÉRIQUE LATINE (dir.). Les phénomènes de frontière dans les pays tropicaux : Table ronde organisée en l’honneur de Pierre Monbeig. Nouvelle édition [en ligne]. Paris : Éditions de l’IHEAL, 1981 (généré le 19 avril 2019). Disponible sur Internet : <http://books.openedition.org/iheal/1375?mobile=1>. ISBN : 9782371540255. DOI : 10.4000/books.iheal.1375.